Centrum Wiskunde & Informatica: Do Code Smells Impact the Effort of Different Maintenance Programming Activities? Empirical studies have shown so far that code smells have relatively low impact over maintenance effort at file level. We surmise that previous studies have found low effects of code smells because the effort considered is a “sheer-effort” that does not distinguish between the kinds of developers’ activities. In our study, we investigate the effects of code smells at the activity level. Examples of activities are: reading, editing, searching, and navigating, which are performed independently over different files during maintenance. We conjecture that structural attributes represented in the form of different code smells do indeed have an effect on the effort for performing certain kinds of activities. 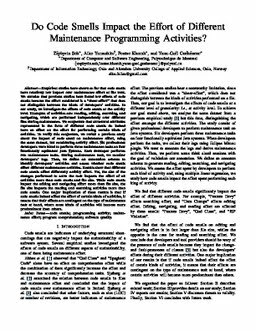 To verify this conjecture, we revisit a previous study about the impact of code smell on maintenance effort, using the same dataset, but considering activity effort. Six professional developers were hired to perform three maintenance tasks on four functionally equivalent Java Systems. Each developer performs two maintenance tasks. During maintenance task, we monitor developers’ logs. Then, we define an annotation schema to identify developers’ activities and assess whether code smells affect different maintenance activities. Results show that different code smells affect differently activity effort. Yet, the size of the changes performed to solve the task impacts the effort of all activities more than code smells and file size. While code smells impact the editing and navigating effort more than file size, the file size impacts the reading and searching activities more than code smells. One major implication of these results is that if code smells indeed affect the effort of certain kinds of activities, it means that their effects are contingent on the type of maintenance task at hand, where some kinds of activities will become more predominant than others.